Photos of Melania Trump are going viral on social media after some Twitter users said they believed the first lady was using a body double for public appearances. 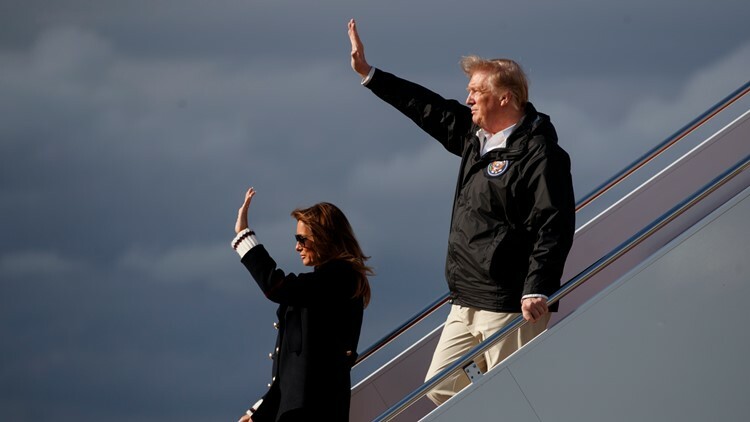 While the Trump administration surveyed tornado damage in Alabama several Twitter users posted conspiracies about whether the president was traveling with a body double portraying his wife, First Lady Melania Trump. The theory that Melania Trump had a body double for public appearances began in 2017, according to Vox. During a press conference in October 2017, Twitter user Joe Vargas noticed the first lady did not look like herself. Vargas' tweet went viral as people tried to decipher whether the woman standing beside Trump was Melania. While the original claims were denied by fact-checkers, the #FakeMelania conspiracy returned Friday, March 8, after an Alabama television reporter posted a photo of the Trumps viewing the crosses representing the state's 23 tornado victims. Twitter users compared the woman in the picture's height and face to other photos of Melania, arguing that the two are not the same woman. "I know everyone likes to laugh about how stupid the #FakeMelania conspiracy is. So let's just look at these two pictures from yesterday," Twitter user Gareth Dimelow said. "How does a human being shrink a good five inches in a matter of hours?" Many Twitter users responded to the theories, commenting that lighting and makeup are the most likely causes for the mistaken identity. "Makeup, lighting, shoes and clothing can make people look vastly different from photo to photo," Twitter user PositivePyramids said. Still, the photos have caused thousands of tweets debating Trump's facial features and posture.